The area around Davidson Glacier has miles of forest trails that are muddy, technical, and fun. With this tour, skip walking the trails for a headlong journey into remote terrain on high-powered ATVs. 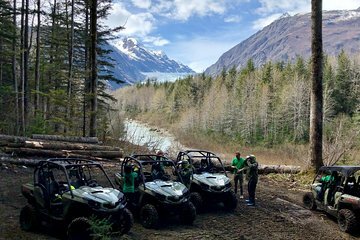 Start with a boat ride down Lynn Canal, ride the ATVs past forests, beaches, and mountains, and finish with a picnic lunch on a beach. My husband and I had a blast on this excursion! i would highly recommend this experience. fun and informative!